The Worther Shorty pencil was sent to me by Pen Heaven to test and review here on the blog. Thoughts shared in this review are entirely my own. I was not familiar with the Worther Shorty when it was sent to me by Pen Heaven. Mechanical / pencil holders were not on my radar, but apparently the Worther Shorty is a popular choice. As the name implies this is a short and chunky hexagonal pencil. I have the Rosa colour but there are loads of different colour variations to choose from. The design of the pencil holder is really simple with no branding despite a tiny hint at the brand name on the top of the knock. The pencil holder has a soft touch finish to it that really helps with the grip and honestly is one of my favourite features on this pencil holder. Finally there is a teeny tiny pen clip in case you want to use it. I am not sure how effective this would be, but it’s there. Now onto the filling...the Shorty holds some chunky graphite (3mm, 7B lead). I am a harder graphite user normally so adjusting to the 7B was a little strange, but when using it for sketching it works quite nicely. The graphite rests within the pencil and by suppressing the knock and very carefully up-ending the pencil the graphite appears. You then adjust the length in a similar fashion to a traditional mechanical pencil. You also get a few sticks of graphite with the pencil which is helpful and they come pre-sharpened. As you use the pencil, understandably, it loses it’s pointy tip and wears down with use. I don’t have a tool to sharpen these graphite sticks but even though this is a 7B I haven’t found it wares down too quickly. I have enjoyed playing around with this graphite holder. The size works well as it fits into most pencil cases or bags, despite the chunk. Plus it’s really light to hold which means if you’re sketching for long periods then you’re not going to suffer from wrist ache. I will be swapping out the filling on my Worther Shorty for a coloured lead, red or blue, as I am finding it far more enjoyable to use for sketching. I also need a sharpening tool of some description. I really like my Shorty and I’m pleased it was introduced to me. It’s a simple, compact lead holder that can be adapted to the users requirements and I plan to make some changes. The tactile feel of this pencil is also really nice. It instantly makes this pencil better to use. I want to thank Pen Heaven for sending me this product to review. Baron Fig sent me a copy of their limited edition School Set to review here on the blog. I have been using these for a while now and have thoughts to share with you. Although Baron Fig provided me these items to review this is no way changes my opinions shared. The Baron Fig School Set is the first time we have seen a limited edition release combining two of Baron Figs staple products, the Flagship Vanguard notebook and the Archer pencil. The School Set pays homage to traditional American school classics, the composition notebook and the yellow pencil. If you are American there is no doubt these notebooks will be tinged in nostalgia and perhaps a bit of a marmite release for Baron Fig. For those outside of American your view on the composition notebook design and the classic yellow pencil will probably be very different. Personally I find the mottled design of a composition notebook busy and not particularly appealing. The colour choices used in this edition make it far more appealing to a broader audience and was a clever move by Baron Fig. Three black composition notebooks would have been very dull. Inside these notebooks, and I believe this is a Baron Fig limited edition first, we have lined pages. (Hurrah!) If you're doing any sort of long form writing whether it's morning pages, writing your next great novel, or recording your thoughts in a journal then I don’t believe you can beat lined pages. The paper is the normal Baron Fig stock that I enjoy using. In this release there are some school related extras on the inside covers of the notebook. The inside front cover has a place to record your personal information and the inside back cover has punctuation definitions and uses, speech and a conversion table. All very relevant to a School Set theme and actually quite useful. The Archer pencil is the traditional yellow American pencil colour with a green dipped end. The main different between the School Set Archer and the traditional school yellow pencil is the lack of ferrule and eraser. The yellow and green contrast one another beautifully, it's a match made in pencil lacquer heaven. Standard Archer pencil and the School Set pencils. The Archer pencil included with the School Set I would guess is identical to the standard grey Archer pencil, just a different paint job. It is a HB grade that has good point retention, even on the Baron Fig toothy paper, and a lovely smooth graphite. I used these pencils for writing during NaNoWriMo and thoroughly enjoyed them. The pencil weight is perfect as there is no ferrule and eraser, making it extremely comfortable. The graphite was smooth to write with and paired alongside the School Set notebook it was a really nice writing experience. Writing sample of the Archer pencils. I have finished all three of my School Set notebooks during this years NaNoWriMo. Personally I really liked the colours and it was nice to see a limited edition with a lined ruling. The School Set is a solid release from Baron Fig perfectly planned for the back to school period adding a Baron Fig spin to an American classic. Thanks again to Baron Fig for sending me the School Set limited edition to review. 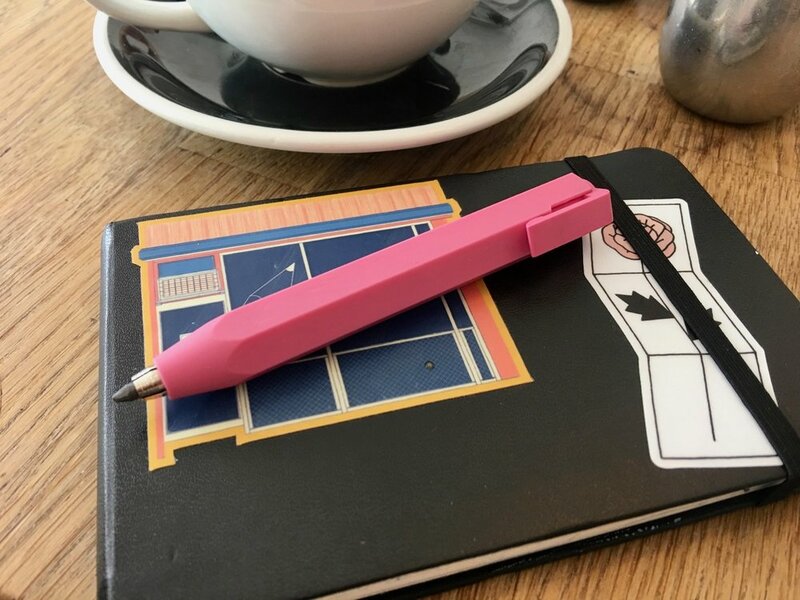 It has been a while since I have done an actual review here on the blog and to kick off the new year I thought I would start with a pencil review. The Camel HB pencil is one I have been pining for. It’s a beautiful looking pencil and the more I saw and heard, the more I wanted it. But there is one small issue, in the UK it is impossible to come by. The only place I have seen this online is from CW Pencils and the international shipping rates for the few pencils I would want to buy was something I couldn’t justify. Then a few months later, as if by magic, in stepped Priya from The London Parchment. A colleague of hers would be visiting the US and she was going to place a CW Pencils order and she wondered if I would like to add anything. Obviously I jumped at the chance! After pining for quite some time, waiting for this pencil to arrive, actually holding it in my hand and using it, it doesn’t disappoint. I was expecting to find faults with it because I had built it up so much, but it turns out this pencil is wonderful. The design is classic. It has a natural finish barrel with a clear lacquer on the barrel giving it a protective sheen. The branding is minimal and embossed in white which makes the pencil look clean. The distinctive feature with the Camel HB is the eraser that sits flush to the pencil barrel. There is no ferrule. I haven’t seen any other pencil like it. Because there is no ferrule this pencil is really, really lightweight making it a pleasure to write with. Personally I prefer a pencil without an eraser due to the weight, so this fits perfectly. When it comes to actually using the pencil you’re not disappointed. Point retention is great, it sharpens beautifully giving a nice clean finish on the wood. The graphite writes really smoothly on a wide variety of different paper types. In terms of how the graphite prints on the page, its colour is nice. Its a dark enough grey, but not too dark and it doesn’t smudge or print on other pages. I am sure you have guessed, but I like this pencil, a lot. It’s a beauty. I am so pleased I managed to get my hands on a few of them. It’s just such a shame that these pencils are so hard to come by. I’d love to see European distribution of the Camel pencils. Alongside the natural finish I also took the chance to grab some of the pastel finish pencils. I have not used these much at all but I would presume they perform in the same way. The pastel colours are so pretty and come in some gorgeous colours. I picked up the mint, purple and pink giving myself a nice stock for my pencil usage. My pastel Camel pencils. Beautiful colours.